On Tuesday, May, 15, 2007, the Beaver Island Community School network was attacked. The network is still not working as this is written. None of the students at the BICS have Internet access. The plan for this special "intercession" week at BICS included an individualized mathematics program called "Accelerated Mathematics" which required each student to have access to a card reader that was connected to the Internet. With the school without Internet access, this was going to be very difficult. After a phone call to Brian Tort of Central Solutions, the issue was resolved. After dinner time, Brian arrived at Joe Moore's house to set up his laptop on the Central Solutions wireless network. With the necessary configuration, Joe's laptop would be able to access the Internet from BICS using the Central Solutions Harbor Area wireless network. A little before 11 p.m., the card reader, laptop, and printer were configured and all 19 BICS students had assignments printed in preparation for the 8:15 a.m. program was to begin. "My hat is off to Brian and his company," Joe said. "There is no way this program would have worked this morning without his help." William Sauter of Processing Concepts Limited, based in Traverse City, is currently awaiting the fog to clear (10:10 a.m., Wednesday, May 16, 2007) to get to the Island to work on the BICS network. The weather did not cooperate today, so William Sauter did not get to school for the work on fixing the school network. Limited network access was granted to the administration and lead teachers. The request was that no one try to use the Internet until the problems may be resolved. William will make an attempt to fly to the Island tommorrow to do the required work. "The Central Solutions wireless access worked like a charm," Joe Moore said. "Students were able to complete and grade the assignments across the Internet using the wireless connection provided by Central Solutions. New assignments and tests were also able to be downloaded and worked on. Thanks, again, Bryan." Age 87. May 13, 2007. Beloved husband of the late Dorothy (nee Gatliff). Loving father of Catherine (the late Robert) Federspiel, Sr. Ellen, IHM, Frank (Pauline), Audrey, and Patrick. Proud grandfather of Amy, Kelly, and Frank Licavoli; Eric and Dorothy Federspiel, and Renee and Brendan Barone. Great-grandfather of Dakota, Caitlin and Jacob. Dear brother of Anthony (Lena), Elizabeth (Joseph) Prezzato , Frances (Joseph) Romano, and Salvatore (Bea). Visitation at the St. Clair Shores Chapel of Bagnasco & Calcaterra Funeral Home, 25800 Harper (3 blocks north of 10 Mile) on Wednesday 2-9 p.m. with Prayers at 7 p.m. Funeral Thursday Instate 9:30 a.m. until Mass 10 a.m. at St. Joan of Arc Catholic Church, Mack Avenue between 8 and 9 Mile Rds. Interment Mt. Olivet Cemetery. To share a memory, visit www.bcfh.com . The annual cocktail party will be held by the AMVETS Post #46 Ladies Auxiliary on Tuesday , June 5, 5:00 PM at the home of Dee Gallagher, 38360 Indian Point Road. Cocktails and hors d'oeuvres will be provided by the members to honor the women of Beaver Island. All women welcome. This occasion has become an eagerly awaited yearly event for the women to gather to have beverages, good food, good conversation and a good time. 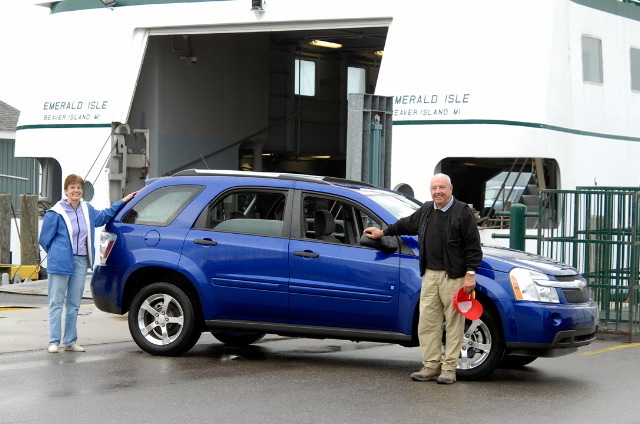 This year's Health Center raffle vehicle arrived on the Emerald Isle on May 9, and it's a beauty. 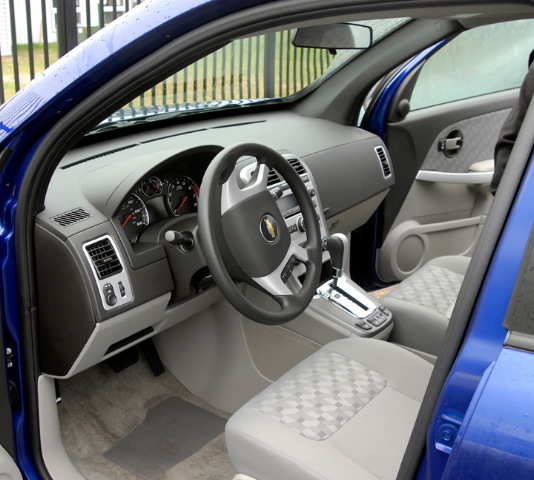 A 2007 Chevrolet Equinox, which is listed as a 'mid-sized, crossover SUV,' this model is a stunning Laser Blue Metallic, which at first look appears blue, but closer up seems to have a bit more purple. But as well all know, a car by any other color would look as sweet. Or something like that. those winter trips around the Island . music throughout the vehicle via six strategically placed speakers - slip in your favorite Coltrane disc and life is supreme. A multi-flex sliding rear seat, with a 60-40 split seatback translates into versatility. Add four-wheel anti-lock disc brakes, power locks, remote keyless entry, cruise control, dual front map lights, air bags, and a rear child seat latch system, and you've got the total package ready for you to drive away. McDonough's Market where the Equinox will be on display. The drawing will be held on Labor Day. Merriam "FAH" Neurohr, 75, of Traverse City , formerly of Atlanta , Ga. , and Beaver Island , passed away at her home on May 12, 2007, after a long, courageous battle with cancer. Graveside services will be held at 3 p.m. today, May 14, at Oakwood Cemetery , with Rabbi Albert M. Lewis officiating. Merriam was born in Flint on April 18, 1932, to Gussie and Abe Gottfelt. She married Edward Neurohr, and together they operated Bella Pizza restaurant in Sandy Springs ( Atlanta ) for 24 years. Though recently in declining health, she never stopped traveling, knitting, making friends at every opportunity, and visiting family. She spent her final year taking part in experimental treatments, taking satisfaction in the fact that the research would help heal others. Merriam was preceded in death by a daughter, Ellie Neurohr. Survivors include her husband of 57 years, Edward; daughter and son-in-law, Susan and Dennis Winslow of Traverse City; son and daughter-in-law, Rich and Debbie Neurohr of Las Vegas; son and daughter-in-law, Avi and Tresa Neurohr of Chicago; grandchildren, Allison, Rachel and Jessie Winslow, and Ella and Langston Neurohr. Memorial donations may be made to Congregation Beth El, 311 South Park St. , Traverse City , MI 49684 , or the Buzzing for Change Foundation, P.O. Box 15210 , Philadelphia , PA 19125 . Buzzing for Change is a university student-run charity event to benefit children with cancer. The Beaver Island Chamber of Commerce board selected “Water Woods Wonderland” as the theme for the 2007 July 4 parade. The parade starts at 2:00PM on July 4. For additional parade information contact the Chamber office at (231) 448-2505 or chamber@csyip.net . “As a result of dramatic membership growth the Beaver Island Chamber of Commerce is better prepared than ever to promote island tourism,” said Executive Director Steve West. This year the Chamber will spend about $20,000 marketing Beaver Island . Membership has increase from only about 60 five years ago to 116 this year. Because some members operate more than one business, total listings on the web site www.beaverisland.org and in the 2007 Business and Visitor Directory are 140. Chamber growth is evident by looking at the changes in its annually published directory and the increase in the fastest growing membership category, accommodations. In 2002 the two color 19 page directory listed 11 homes for rent. The 2007 full color publication is 35 pages long, cost 63 cents to mail, features 35 homes to rent and 8 properties offering rooms ands suites. The Chamber distributes 6,500 directories and 10,000 colorful rack cards each year. Jeff Cushman of Island Design does the layout, photography and design for the annual publication. Following the parade again this year, the annual 4 th of July Carnival will be held on the green area by the Jewell Gillespie Public Beach . New games, old games, the dunk tank and bounce house will be featured, as well as arts and crafts of the local artisans and snack tent. This year, businesses are being recruited to sponsor a game booth, and/or provide staff for the carnival. Also, volunteers are needed for set up and clean up. Contact Jacque LaFreniere if you are interested in participating. The 7 th grade will be operating the food area raising funds for next year's trip to Washington DC . We hope to make this the best carnival ever! High school students are using handhelds in the classroom; learner support meetings are being scheduled; and eight families attended a seven week “parenting class” for parents of children ages birth through 5. Judi Meister is being recognized at Treetops Sylvan Resort as one of this year's OPIE (Outstanding Person in Education) award winners. Principal/Superintendent Kitty McNamara and board members Barb Schwartzfisher and Linda McDonough attended a preliminary bond qualification conference in Lansing to review the district's application with representatives from the Michigan Department of Treasury , Thrun Law Firm, BETA Design, Inc., and Stauder BARCH & ASSOCIATES. An informational mailing on the May 8 Annual School Election was sent to all box holders. The board accepted the resignation of teacher Ian Gagnon. Supervisor Don Vyse called the regular meeting of the St. James Township Board to order at 7:30pm on May 2, 2007. Also present were Tim McDonough, Rick Speck, and Jean Palmer. Jim Wojan was absent. Motion by McDonough and seconded to approve the minutes of the April 4, 2007 meeting as written. Motion carried. Vyse reminded everyone of the no burn policy for St. James Township . Palmer reported on the recent WMC meeting held on April 30, 2007. The drawings are ready from the Architect for the addition to the Transfer Station John Works will send to County Building Inspector for review, and when approved the project will be advertised for bids. Darrell Butler will continue to get more information about a stump grinder for the Transfer Station. Vyse stated 10,000 gallons of dust control has been order for St. James Township for this year. Election Inspectors for the upcoming May Consolidated Election to be held on May 8, 2007 were announced by Clerk. They are Kathy Adams, Kathy Ruis, Betty Scoggin, Sue Welke, and Delores Gallagher. Approval was given by Board to put out donation boxes for Fireworks. Clerk will contact Am-Vets to use boxes they recently had out. Boxes to go out by Memorial Day. The Beaver Island Rural Health Center , represented by Sue Solle and Donna Kubic, is asking the Township Board for a letter of support for their latest grant request for digital x-ray equipment. Motion by Vyse and seconded by Palmer to approve request for letter of support. Brian Tort with Central Solutions explained to the Board how he is working on the High Speed Internet Service for the Island . Tort stated a 180ft tower would cover the majority of Donegal Bay area. The zoning ordinance does not allow for a tower of that height on private land. But in the “PLFD” Public Land and Facilities District a tower of 180ft is allowable. The Township owns 40 acres which includes the drain field area and the Township Campground where a tower of this height could be constructed. The cost of this type of project is approximately $150,000. Vyse will check with USDA for funding possibilities, because if the tower were owned by the Twp and leased to Central Solutions, then the Twp could go for a grant. Motion was made by Vyse to continue to work with Central Solutions with the possibility of placement of a tower on Township property on Donegal Bay Road . Seconded by Speck. Motion carried. Motion by Vyse to adjourn meeting at 8:20pm.  Emma Elizabeth Adams has received a Volleyball Scholarship to Albion College . She plans to pursue a bachelor's degree.  Anthony James Bousquet would like to take at least a year off to work and then hopefully, be able to travel around Europe .  David Michael Bousquet has been accepted at Northwestern Michigan College in Traverse City . He would like to get a degree in Mechanical Engineering.  Saygan Kerr Croswhite graduates with honors and has been accepted at Northwestern Michigan College and would like to pursue a degree in Biology.  Brenna McNamara Green has been accepted at Northern Michigan University in Marquette and plans to work toward a degree in Elementary Education.  Bailey Kathleen McDonough has been accepted at Northwestern Michigan College and plans to get her nursing basics completed before transferring to another University.  Rita Jewell Palmer would like to attend Northwestern Michigan College and then transfer to Boston Berkley Music School .  David Schwartzfisher h as been accepted at Northwestern Michigan College and would like to pursue a Culinary Arts Degree.  Cory Allen Sowa plans to attend Musician's Institute in Hollywood , California . He hopes to get his Associates in Music Performance.  Jared Gerard Wojan has been accepted at both Mid-Michigan Community College and Central Michigan University . He would like to pursue a degree in Elementary Education.